These words were uttered by saxophonist Eli “Lucky” Thompson on March 20, 1968 (1) and seem incredible in view of both the quality and quantity of the music he had produced to that point. One wonders what goals and directions he had in mind but sadly, by this time his career as a performing musician was largely over and we can only speculate as to what might have been. Ironically, Thompson appears on some of the seminal recordings of bebop and its successor, hard bop yet was not really a “modernist” in the sense that word was used in the 1940s and 1950s. Eschewing the direct influences of Charlie Parker and Lester Young who had provided the stylistic framework for most of the post-swing era saxophonists, Thompson instead drew on Coleman Hawkins, Ben Webster and Don Byas for his inspiration, updating those sources harmonically and rhythmically to create a unique sound and conception. His solos on tenor saxophone are compositionally assembled and emotionally evocative. When he enters, one is seduced by the sheer elegance and power of his statements into listening attentively. In the late 1950s, he added the soprano saxophone which instrument he personalized in a manner quite different from that employed contemporaneously by the much higher profile John Coltrane. While many sources state that Thompson was born in Detroit, MI, he revealed in a 1981 interview with Christopher Kuhl (2) that his birthplace was, in fact, Columbia, SC but that his mother migrated north shortly after his birth on June 16, 1923. (3) It was in Detroit that he was raised and received his first musical training and exposure to jazz. His first recordings date from 1943 and his last took place in 1973 (possibly 1974 – see the discography). The 30 yearlong legacy Thompson has left us is a rich one, including some of the most influential and revered recordings of the music’s first century. Like a few other musicians, most notably his contemporary Gigi Gryce, Thompson was concerned, almost to the point of obsession, with the exploitation of jazz artists and their works by entrenched and unscrupulous individuals and practices in the recording and publishing industries. He railed continually against the injustices he witnessed and after a stab at teaching in the early 1970s (Dartmouth College), his bitterness and frustration caused him to withdraw essentially completely from the limelight. He lived for a while in Savannah, GA where the Kuhl interview took place. In the early 1990s, he was discovered in the Seattle, WA area in a homeless condition but fortunately, some kind and artistically aware local residents realized who he was and assisted him in obtaining medical attention and shelter. Thompson spent many years in a Seattle nursing home and for the most part, had refused or been unable for medical reasons to be drawn into meaningful discussions of his past experiences and achievements. Visitors, including famous former collaborators, reportedly found him bitter and paranoid. However, an interview, by Daniel Brecker in 1995, was broadcast on KCMU-FM (Seattle), and is available on saxophonist Mel Martin’s website. 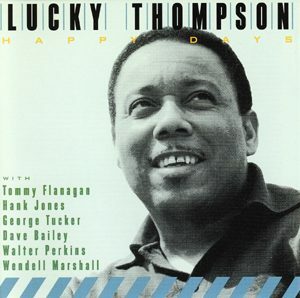 Lucky Thompson passed away on July 30, 2005. (3) Although most sources give June 16, 1924 as Thompson’s date of birth, this earlier date is the one he provided on his SS-5 form (application for Social Security number) in 1941. Census records also are consistent with 1923. This table (pdf) lists solos of Lucky Thompson by recording date and performance title between 1944 and 1974. The information, which includes solo duration, is also found in the discography, from which the data was extracted. Eli “Lucky” Thompson 1943-1950: Roots of Modern Jazz – The Be Bop Era, Vol. 13 by Dieter Salemann, ©2001; This is available for purchase from The Jazz Record Center. Lucky Thompson Discography, Part One, 1944-51 by Tony Williams, ©1967; A copy of this discography can be found at The Institute of Jazz Studies(but you have to visit the Institute to access it – it cannot be viewed online). And a complete discography is now available in both print and CD-ROM formats: Lucky Thompson Discography by Bob Weir; published in 2010 by Names & Numbers (Almere, The Netherlands). Contact Gerard Hoogeveen. 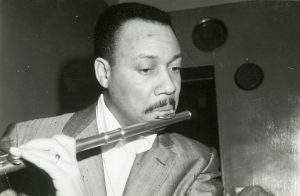 Lead sheets of Lucky Thompson’s compositions are available from Jazz Lead Sheets. Lucky Thompson was visited by several musicians from the Lincoln Center Jazz Orchestra in Seattle, in January 2005. See the article by trumpeter Marcus Printup in the May 2006 issue of DownBeat Magazine (p. 22) entitled A Lucky Awakening. 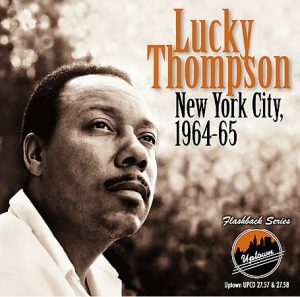 See Philip Coady’s article Remembering Lucky Thompson (1924-2005) in Earshot Jazz, September 2005. See also Tad Shull’s essay When Backward Comes Out Ahead: Lucky Thompson’s Phrasing and Improvisation published in Annual Review of Jazz Studies 12: 2002, Scarecrow Press, 2004. And Noal Cohen and Chris Byars, Lucky Thompson In Paris: The 1961 Candid Records Session. Current Research in Jazz 2, (2010). Saxophonist Michael Blake has recorded a CD of mostly Lucky Thompson compositions. The album is entitled The World Awakes: A Tribute to Eli “Lucky” Thompson, Stunt Records STUCD 07092 (2007). Pianist Eric Reed did a week-long tribute to Lucky Thompson at Dizzy’s Club Coca Cola, December 15-20, 2009. His excellent quartet included saxophonist Victor Goines, bassist Reuben Rogers and drummer Rodney Green. Saxophonist Chris Byars has recorded a number of Lucky Thompson original compositions for a CD to be released on the Steeplechase record label in April 2011 (Update April 27, 2011: This CD has been released as Lucky Strikes Again, Steeplechase SCCD 31713). Byars’s octet previewed some of these arrangements during a live performance at Smalls Jazz Club on Sept. 17, 2010. 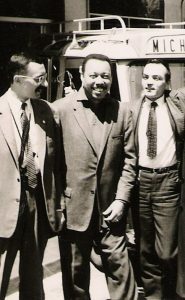 I gave a presentation entitled “Lucky Thompson on European Radio and Television, 1957-1962” at The Institute of Jazz Studies Jazz Research Roundtable on February 17, 2016. Thompson was inactive musically for nearly all of 1958, living on a farm in Belleville, MI. In November of that year, he returned to France where he remained until November 1962. This photo was probably taken at Le Chat Qui Peche Club. There are no know recordings of Thompson on flute although he did a broadcast on French radio playing that instrument. Sadly, the tape of the broadcast no longer exists. Many thanks to Michael Fitzgerald and Steve Albin (JazzDiscography.com), Axel Van Looy, Pete Bainbridge, Maurice Rolfe, Jud Warren, Ashwin Panemangalore, Sid Gribetz (WKCR), Bob Van Langen, Dan Skea, Richard Weize (Bear Family Records), Steve Schwartz (WGBH), Wolfram Knauer (Jazzinstitut Darmstadt), Bill Damm, Peter Pullman, Jim Wilke (Jazz After Hours), Paul DeBarros (Seattle Times), Lola Pedrini (Earshot Jazz), Tony at Group Harmony, George Schuller, Loren Schoenberg, Michael Cuscuna (Mosaic Records), Chuck Nessa, Fernando Ortiz de Urbina, Chris Sheridan, Uwe Weiler, Francois Ziegler, Bernd Zimmermann, Michael Weil, Guy Kopelowicz, Ed Chaplin, Ronald Lyles, Bob Weir, Dennis Whitling, Arild Wideröe, Hans Jensen, Anders Bergön, Frank Buchmann-Møller, Michel Ruppli, Larry Kart, Sergio Portaleoni, Peter Smithson, Claude Schlouch, Patrick Judycki, Victoria Padin (Radio Sweden), Chris Byars, Jackie Cain, Bill Crow, Ricky Riccardi, Bob Sunenblick, Chris Albertson, Jim Farrington, Bob Blumenthal, Joop Aarts, Levy Jonasson, Mike Vawdrey, Bruno Leicht, Adrian Daff, Rolf Jungquist, Peter Losin, Jan van Meenen, Jay Becker, David Tenner, Adam Brenner, Branko Prpa, Agustín Pérez, Desne Ahlers, Daniel Richard, Anthony Barnett, Cornelis Hazevoet, Ken Gross and the folks at The Institute of Jazz Studies, especially Ed Berger, Vincent Pelote, Joe Peterson, Ryan Maloney, April Grier and the late John Clement for providing information and assistance.